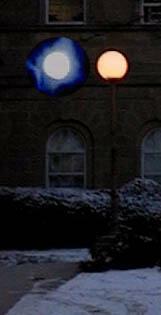 This is a photograph of our Model Sun (on the right) taken during the early evening hours. The picture was taken while standing at the point where Model Earth would be located. To the left of the Model Sun is a superimposed image of the actual Sun that was photographed with the same camera using exactly the same zoom settings. As you can see, the disk size appearance for both objects is exactly the same. In other words, by standing at Earth's location on the Stroll and gazing back at the Model Sun, you are given the true size appearance of our actual Sun. 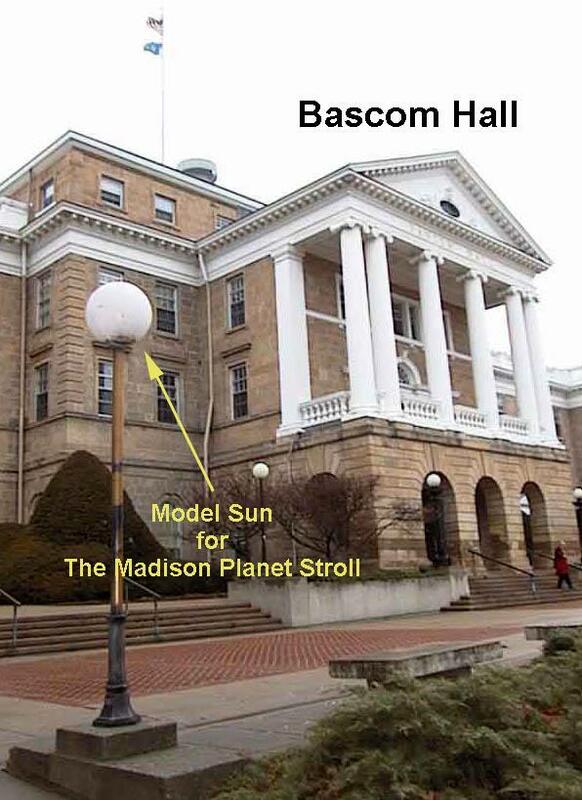 Now, this is very neat, because it means that if we view the Model Sun from any other planet location along the stroll, we will immediately see what the actual Sun would look like if we could stand on the real planet's surface and look back at our solar companion. As shown below, this has been done for you for the planets from Mercury to Jupiter, inclusive. This exercise was not possible for the planets beyond Jupiter mainly due to visual obstructions encountered along the way. From top to bottom, this is the Model Sun viewed from the Planet Stroll positions for Mercury, Venus, Earth, Mars, and finally Jupiter.